Oh my goodness – what a long day. We drove to Hana today and what an adventure. Most guidebooks and people in the know recommend being on the road by 7am. 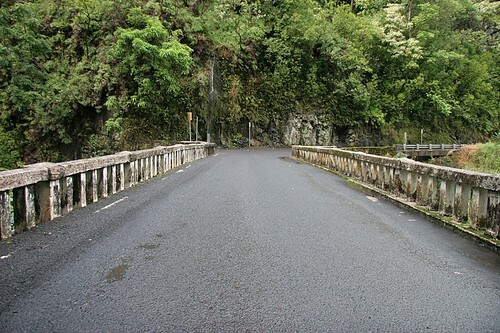 This allows you to beat the rush of people driving to Hana. That is true – it does make it a bit easier. We got up at 5am, ate breakfast and we were on the road by 6:15. 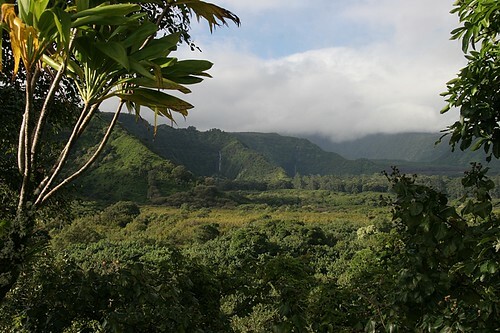 It is about 45 minutes from Napili in West Maui to Kahului and the start of the Hana Highway. 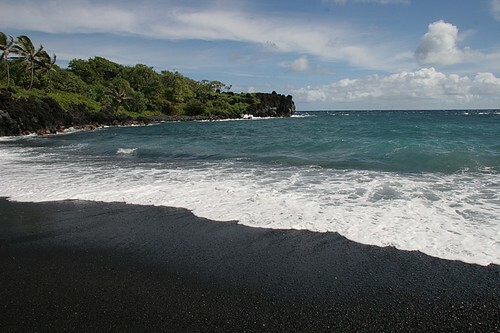 It is officially 48 miles from Kakului to Hana. Expect it to take almost 4 hours. It was pretty quiet once we left Haiku. There are a couple of items to be aware if you do start the trip this early. 1) You will meet several locals in pickup trucks or business vans on their way to work. Prepare to pull aside. 2) You will be driving into the rising sun. Bring sunglasses – especially if it has rained because it will be bright. It is challenging going from the deep dark tropical hillside and around a narrow curve to the bright sunshine. 3) Most of the roadside stands will be closed. We took our time pulling off to see the bridges and waterfalls. The road is extremely windy. The recommended speed limit is 15 miles per hour and you will not want to go much faster. In addition to blind curves, there are numerous one lane bridges and passages. Just slow down and get on Maui Time. We got to Wainapanapa State Park by about 11:00am and stopped for lunch. I was hungry after all those curves. 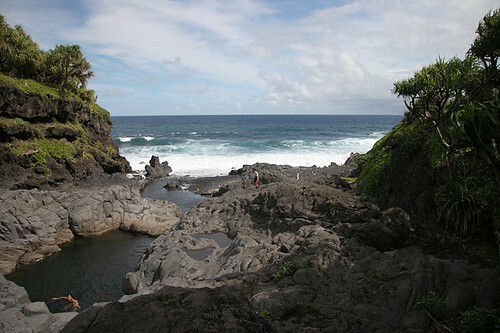 We didn’t take much time to explore Hana but we did walk down to Hamoa Beach which was beautiful and almost deserted. We headed out to the 7 Sacred Pools at O’helo Gulch which is actually part of Haleakala National Park. We walked the loop trail enjoying the vistas. 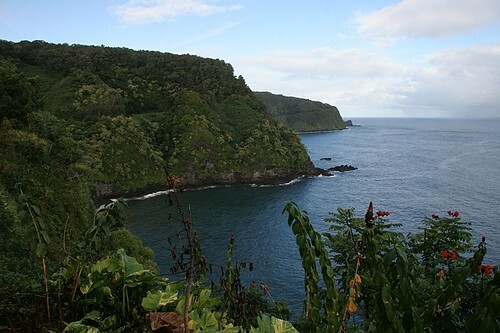 Here are some photos of the Road to Hana on the north side of Maui. I’ll blog later about the *return* from Hana after our return home. We’re flying tomorrow – I’m not ready to leave but it is time to go. I remember the drive so well. All those curves and bridges just big enough for one car…I held my breath alot. Your photos are beautiful. 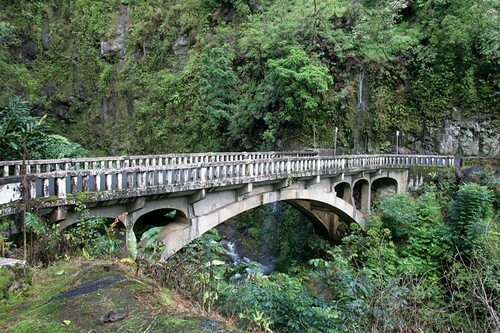 Hi Marta, sounds like quite the adventure driving the curvy, narrow road to Hana. But what a fabulous treat to get to see the beautiful views. Sounds like you had a great time on Maui and did a lot with some relaxation time too. Thank you so much for sharing your experiences and beautiful photos. Safe travels home. Magnificant. You really captured the beauty of this part of Maui. Loved your phrase: “Just slow down and get on Maui Time.” Truthfully, I have never completed the trip the two times I tried – I actually got car sick (and only on this road) both times. There never seems to be enough time to enjoy Maui. At least you are close by (west coast) to make it a pleasurable plane ride. Unlike the 10+ hours for us. The end result keeps us going back tho. Beautiful photos, Marta! Thank you for sharing them with us. Looks like a beautiful place to visit. Your pictures make me think it was worth getting up before the crack of dawn and the curvy road. I hope you had a good trip home. Ahh, it looks like paradise.